Industrial sewing machines are used for many different things. From upholstery to apparel, industrial sewing machines are able to handle voluminous as well as a wide variety of materials. Don’t let the term scare you, but the truth is that an industrial sewing machine isn’t just for those in the business of large-scale clothing manufacturing but also for those who sew professionally. Whether you’re owner of a factory that’s mass-producing garments or a small-time dressmaker or tailor doing business at home, you need to identify the best unit for you to avoid the hassle and to ensure that you’re getting great value from your investment. 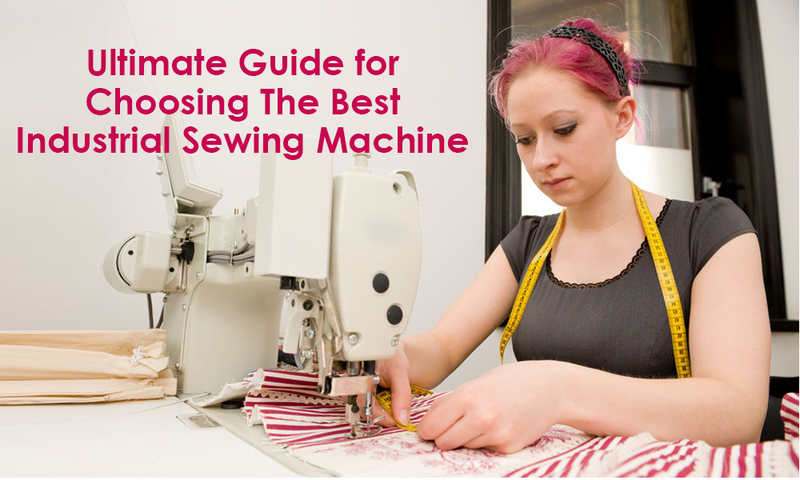 Here are top 7 features to look closely at if you want to buy the perfect industrial sewing machine. I personally like F1. Boom! you are there, quickly and as fast as possible. So in the business of sewing or doing it professionally, you need to be as fast as possible. Yes! you need to have an efficient fast industrial sewing workhorse. Industrial sewing machines can offer a range of 1,000 to at least 5,000 stitches per minute — much faster than the home-type units. While it sounds like you can finish a project with high-speed equipment, take note that a faster stitching capability may not be reliable when working on leather and other thicker materials. The power consumption of the industrial sewing machines should be considered especially when you’re planning to use one at home where electric bills are a concern. Remember that these machines are meant for heavy use, and thus, could normally have high energy consumption. Fortunately, there are Eco-friendly brands that manufacture machines with low power consumption. You might also want to look into whether your house or factory is powered by 110, 220 or 440 lines. While there are machines that are convertible from one power to another, others will require you to perform extra electrical set up to ensure you’re using the right power. The industrial sewing machine of a tailor or dressmaker will differ from that of a manufacturer of leather sofa and car seat covers. The equipment may be manufactured only to suit light to medium fabric while some may only be designed for thick materials like canvas or leather. Some manufacturers offer a guide on what model to use for specific projects. But to be safe or if there’s no guide available, remember that the lifting height of the presser foot should be more than 3 millimeters higher than the thickness of your material. In this way, your leather, canvas or whatever fabric you use can smoothly move in and out under the needle. Not all industrial sewing machines are designed for garment manufacturing. There are highly portable devices that are designed specifically for making bags and upholstery. Other industrial equipment even requires two individuals to operate. In short, understanding why you need industrial sewing equipment will greatly narrow your options on which model to purchase. Most traditional industrial sewing machines are noisy, especially when they are run with a clutch-type motor. While it may not be much of an issue when you’re using the equipment in huge garment factory, you might want to reconsider if you’re using it for domestic use. Luckily, there are brands that market their products as something with noise reduction features. If you can’t find one, consider sewing equipment that run on servo motors, which is known to operate quietly. Despite the noise that clutch motors produce, sewing machines with this type of motor are ideal for working with hard, thick materials such as canvas and leather. On the other hand, working on light and medium fabric will require you to opt for the quieter sewing machines with the modern servo motors, which also provide you with greater flexibility in terms of stitch speed. Servo motors are also great for machines meant to produce decorative stitches. Knowing the required working area will help determine the arm type your sewing machine should have. If you’re working on large materials such as marine upholstery, parachutes or tarpaulins, you’ll need the long-arm type of machines so that you can comfortably pass the fabric underneath the needle. Flat-bed types are your general options when making your products doesn’t really need the post-bed or the cylinder types. Some industrial sewing machines are delivered to your home as already assembled units packed in shipping pallets, especially when they come with the base board. So before you order your product online, make sure to know the shipping and unit dimensions to ensure that the product can pass through your door. The space you have available for your sewing work will affect the kind of machine you can order, especially unit dimensions, body construction and portability. If you have a vast space in your factory, the huge traditional ones won’t be a problem for you. But if you have limited space especially when working at home, you might want to opt with units that are made of light materials and offer high degree of portability. Finding the best industrial sewing machine for you begins when you understand the nature of your work, available storage space, working environment. Your options range from those that can handle delicate fabrics to those that can endure thick materials. Especially when the equipment is for your business, you will want to make sure that your unit will chunk out as may quantity as possible and give you great value for your investments. So if you need a heavy duty sewing machine right now checks out the top 4 reviews below on some of the best industrial sewing machines for sale today. These reviews are sure to help you decide on the best option for your commercial sewing needs.